What’s better than silver or gold? Platinum, of course! Fila’s Italian designers never skimp on style, and you can show off on court wearing the latest collection: The Platinum Collection! All of the pieces in this collection are made with breathable, moisture wicking fabric. It’s also treated to provide UV Protection and incredible stretch, which makes this a great choice for year round play. Fila makes clothes for ladies of all sizes: the XS fits a size 2 and the sizing continues to an XL, which fits sizes 16/18. Since I’m one of the few ladies at my club that hasn’t had some…well…surgical help in the bust department, I really appreciate the design of the Premium Strappy Tennis Tank! This cut is an all new look for Fila, and it will look great with any of the skirts. The tank features an empire waist on Persian Jewel fabric, with contrasting colors of Black and Bursting Marmalade. I love the rouching at the bottom of the cup area of the built in bra. It really flatters that area, along with the criss cross of black straps. The Bursting Marmalade color lends a great pop of color on the waistband and on the left shoulder strap. The Fila logo on the shoulder strap is the updated sporty logo, but this tank also features the reflective F-Box Logo on the front to keep you visible at night! I’d pair this tank with my new favorite: the Laser Cut Tennis Skirt in Black! Sure, this skirt also comes in white, but we all know that black is made to flatter! Fila is jumping on board with the modern trendy look of layers on the back of the skirt, and they have quickly mastered the look. The sporty Fila logo in Bursting Marmalade down the side is a great addition that shows off your Fila loyalty, but has the added bonus of creating a vertical look. When it comes to anything on my booty…I’ll take a vertical over horizontal look any day of the week! Laser cut holes in the layers is another on trend look that we’ve seen on plenty of pros this year on tour, so Fila keeps its eye on what’s working for the best players in the world! 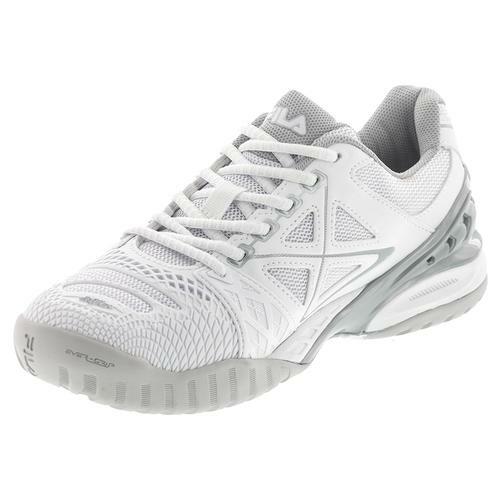 Because I’m the kind of girl that likes to complete a look head to toe, I have a pair of Fila Cage Delirium Cage Shoes in White and Metallic Silver. I’ve played in these shoes for a while, and my friend Pam has reviewed them in a video and a blog, so be sure and check those out for more information about these shoes! The coloring on these shoes is perfect for any outfit. I’ll be honest: they’re basically that awesome pair of white shoes that I can wear anytime with any outfit. They’re also comfortable and durable, so I like to drill or practice in them often! If you love to mix and match your look or you’re buying this collection for a league team, there’s plenty of looks to make everyone happy! The Halter Tank provides coverage of the decolletage area, which is a must for ladies that play a lot in the sun. It gives you a full range of motion with sporty racerback straps, so you won’t feel restricted even though you are modestly covered in the front. Color blocking on the side panels are made to flatter your waist, and this tank does have a bra with removable cups to keep everything in place! The Sleeveless Top is perfect for ladies on your team that like a little more coverage and a classic tennis look. This mostly white top coordinates with the collection by adding a stripe of Persian Jewel Blue across the bust. The Fila sporty logo is also heat transferred at the back of the neck in Bursting Marmalade. For teammates that like sleeves, Fila makes the Cap Sleeve Top in Persian Blue. Your shoulders and chest will be protected by fabric treated to provide UV Protection, and that’s a big plus when you’re playing outside. The cap sleeves won’t restrict your reach for serves and overheads, so pull this shirt on confidently! Some ladies are devotees of the tennis dress, and I don’t blame them! You get ultimate comfort and ultimate style when you wear flattering dresses like the Platinum Dress! I’m showing the front and back of this dress, so you can see the entire fashionable design. I like to think of this as the “business in the front, party in the back look.” The front is simple, unassuming, but flattering…and the back…wow!! The colorblocking is cleverly placed to emphasize your waist and the racerback shows off your shoulders. Fila has upped its game by adding layers of skirt in the back to camouflage and provide extra coverage at the back hem. If you’re looking for great colors, great fit, and great design, don’t pass up the Platinum Collection by Fila!